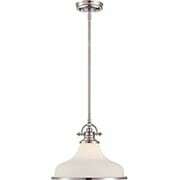 Pendant lights are stylish hanging light fixtures that double as task lighting. Perfect for kitchens, office or living areas, our vintage pendant lighting is available in a wide variety of styles and sizes that will look good in any home. Lambert's unique "half glass, half metal" globe makes a stylish statement in any setting. The white glass shade creates a warm and ambient light, while the cast brass dome provides downward focus, perfect for task lighting. The smaller sizes work well grouped over an island or in a hall, the largest size could stand alone above a table or stairwell. Choose from four classic finishes! 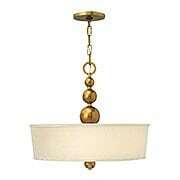 "Stockbridge" style pendant with punched circle design. 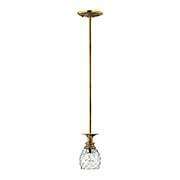 Fixture is made of tin and is available in two finishes. Uses one 150 Watt bulb. UL listed. 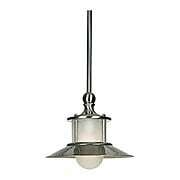 Colonial style saddle lights have a simple charm that is never out of style. 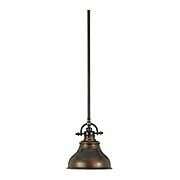 Rustic and homey, they look good everywhere, from the front hall to the bedroom or bath. Hang several over a kitchen island or table for a more modern look. 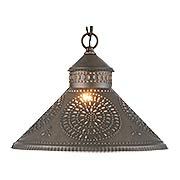 Traditionally made of bent tin with a blackened finish, it features four dripping candle lights. Handcrafted in Pennsylvania. 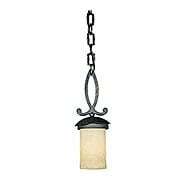 The Rio Salado Mini Pendant brings elegant sophistication to your decor. Delicately fashioned scrolls, adorned with leafy tendrils, an amber-glass shade, and beaded accents combine to create this traditional beauty. Alone, or in groups, it's a striking addition above your kitchen island, countertops, or trestle table. Our Grant mini pendant is an elegant nod to the past. 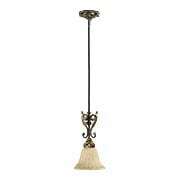 The classic Americana styling features a frosted glass shade with metal accents, a hubble socket, and quirky turned finials. Hung over a kitchen island or sink, it adds a nostalgic accent and provides ample lighting for all your daily tasks. 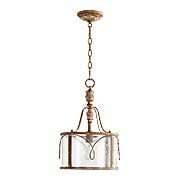 This Federal style pendant is beautifully made from solid brass with a mellow antique finish. The trim ring features a lovely and intricate design of flowers and vines, while the clear "melon" shade creates a bright and sparkling light. 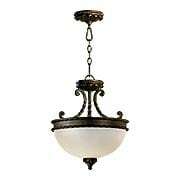 This smaller, single light version has an 8" globe, perfect for a small foyer, powder room or hall. Inspired by dynamic designs of the 1950s, our Zelda pendant makes a bold first impression. The striking silhouette results from a stack of graduated spheres, counter-balanced by a tapered linen shade. For a softer look go with mellow vintage brass, or for a splash of drama, choose brilliant polished nickel! The Bella Cristallo 4-Light Pendant maintains an eclectic mix of influences. This highly decorative piece features contrasting gold and bronze finishes, crystal embellishments, and authentic dripping candle sleeves. 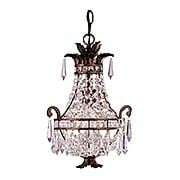 A shining example of traditional sophistication, it is an elegant addition to your dining room, bedroom, or entry. The asymmetrical silhouette of the Gigi 10-Inch Pendant makes a dramatic statement. Its sleek lines impart both glamour and sophistication with its stylish, two-tone heritage brass and stain-black combination. Crafted in the tradition of Old-World European design, the Alameda 2-Light Pendant recalls the romance of age-old architectural detailing. Scrolling, rope-wound arms add a touch of femininity to this rustic creation, while soft, ethereal light radiates through its satin opal-glass shade. The Salento 1-Light Pendant celebrates influences of the southeastern border of Italy. Delicate, imperfectly curved arms appear to bear the weight of its candlestick-styled light, while a leaf motif and asymmetry pay homage to baroque and rococo influences. At home in both traditional and contemporary interiors, it is suited for your living room, foyer, or breakfast nook. 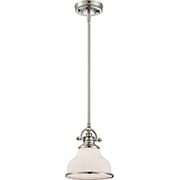 The Florence Island Light adds soft sophistication to your home. Scrolls wrapped in intricate leaf designs coupled with antique styling and clear, hurricane glass create a distinctive look, fitting for a variety of interiors. 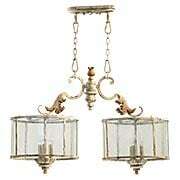 Its Persian-white finish lends a rustic feel. 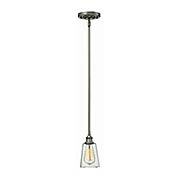 This metal-shaded Emery Rod Hung Mini Pendant is an elegant nod to the past. The classic Americana styling adds a nostalgic flair to your home. When hung over a kitchen island or dinette table it provides ample lighting for all your daily tasks. It is available in three fabulous finishes. Our Grant pendant is an elegant nod to the past. The classic Americana styling features a frosted glass shade with metal accents, a hubble socket, and quirky turned finials. Hung over a kitchen island or sink, it adds a nostalgic accent and provides ample lighting for all your daily tasks. Gentle scrollwork and Tiffany-style shades in classic patterns and colors bring sophistication to the Asheville Collection. 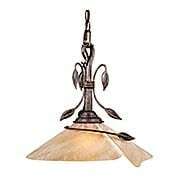 The genuine art-glass shade is hand assembled, and the valiant-bronze finish anchors the traditional styling. 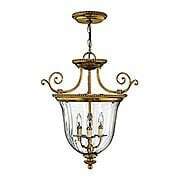 This pendant is an elegant addition to foyers, living rooms, and dining rooms. 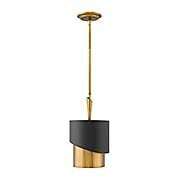 The Wexley 12-Inch Pendant puts a modern twist on a traditional design. This distinctive fixture features a centerpiece of oval-shaped clear glass, decorative cast details, and crystal accents. 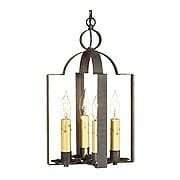 This classic, drum-style lantern features panels of clear bent glass set into a solid brass frame. Petite in scale, yet full of style, it's a wonderful choice for a small foyer or hall. Offered in 4 classic finishes. Since colonial times, the pineapple has symbolized southern hospitality. 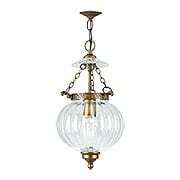 The Plantation lighting series captures this gracious theme in solid brass and hand-blown optic glass. In this petite pendant, a dazzling pineapple is suspended from a beautifully detailed canopy - what an elegant way to brighten your kitchen. The Gatsby collection exudes a retro modern aesthetic inspired by vintage accordion–style elevator gates. 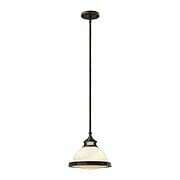 Industrial design details like an authentic cast socket and clear glass shade add to this pendant's nostalgic appeal. Ideal for grouping over your kitchen island, it comes in your choice of two classic finishes. 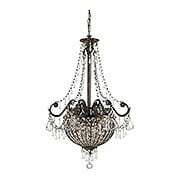 Moorish, Spanish and Gothic influence runs throughout this handsome pendant. The hand-forged iron scrollwork and hammered steel body are finished with a rich, bronze patina for a wonderfully aged effect. Hand-made glass shades emit a soft radiance, creating a romantic atmosphere in any room. Gleaming and streamlined, the New England lighting series pays homage to the grand ocean liners of the 1920s and 1930s. 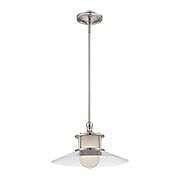 Sleek Deco styling in satiny, brushed nickel works with contemporary or vintage interiors alike. 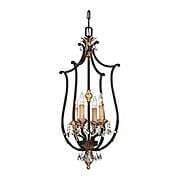 Matching chandelier and flush mount fixtures will deck out your home in style. This petite chandelier is one of a kind. The metal frame features French inspired details, dressed in a tortoise shell finish. Draped in crystals of different shapes and sizes, the Orleans is a dazzling addition to your powder room, hall, or bedroom. Bold and geometric, this striking bowl pendant recalls Frank Lloyd Wright's Prairie glass panels of the early 20th century. 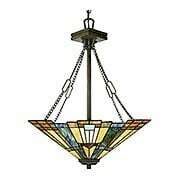 A classic Arts & Crafts piece, it features handcrafted art glass in shades of sapphire blue, warm honey, amber and cream. What a dramatic accent to any vintage or contemporary interior! 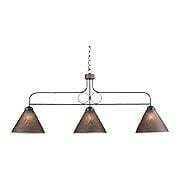 Our Franklin triple pendant works well over a kitchen island or even a dining table. The tapered tin shades are punched with a classic folk art design, which glows brightly when lit from within. Handcrafted in Pennsylvania. Vintage inspired, but modern in outlook, the Amelia Stem Pendant is a fresh and exciting addition to your home. 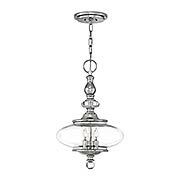 Featuring an etched-glass shade and prismatic etched-glass diffuser, the entire pendant glows with a warm white light - perfect for your kitchen, bath or hall. The cast metal fittings are carefully detailed, creating a refined industrial look. Choose from three classic finish options. Paying homage to its Art Nouveau influence, the Capri Collection lends organic style to any room. This pendant is made up of sweeping petals entwined with intricate, leafy tendrils. 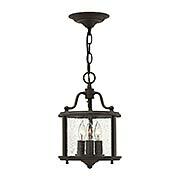 Its bold silhouette is tempered with excavation glass and a black walnut finish for a soft, romantic edge. 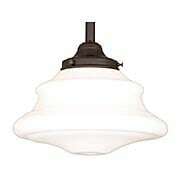 Evoking 1930's style, Petersburg school house pendants and flush mounts are a timeless addition to your home. Offered in multiple sizes and finishes, you'll find options for every room, from kitchen to foyer. 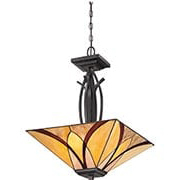 This vintage design features a bell canopy, straight stem, and classic opal-glass shade.